Joseph William was born in Co. Longford on c.16 July 1881* and was baptised on 28 July 1881 in the parish of Streete. It is believed that his father was William Prendergast, who was a sub-Constable in the RIC**. The family appears to have emigrated to the U.S. c.16 June 1886 and settled in New York. James petitioned to become a US Citizen in August 1904; he worked as a steamfitter*** likely at the dockyards. It is believed that Joseph had first enlisted with the U.S. Army on the 31 January 1905. 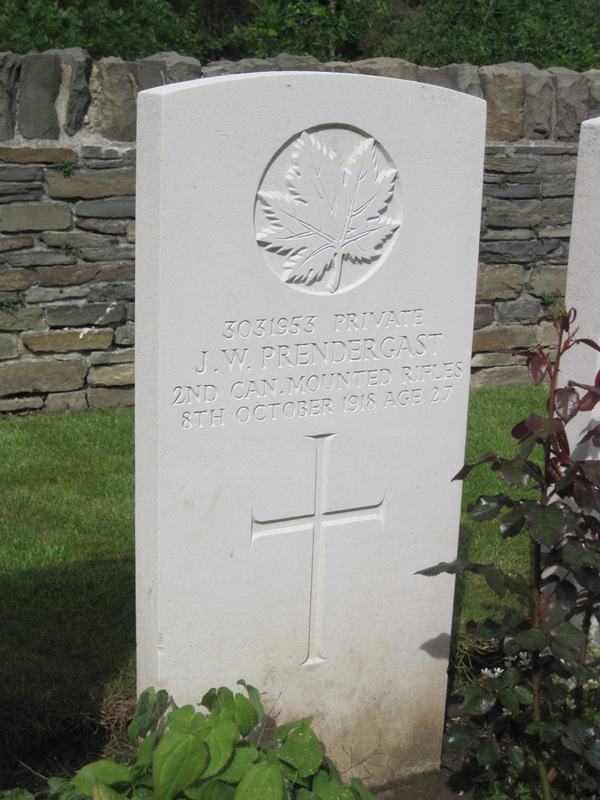 Joseph enlisted in the Canadian Expeditionary Force on 2 January 1918 in Toronto, Canada. He gave his sister Elizabeth Watkinson, who was living on Long Island, as his next-of-kin. He was killed in action during the Battle of Cambrai 1918. *Joseph gave 1882 as year of birth in official records. **Birth registry for Elizabeth Prendergast, Boyle 1877. ***John Carney of 330 E 35th Street was his witness.